Shortly after NASA was established in 1958, the nation's top scientists compiled a list of missions they thought the brand-new space agency should pursue. The proposals were heady, considering at that point only three satellites had ever been launched. Researchers suggested an Earth-orbiting telescope that could detect the universe's most distant stars, probes that would venture to the solar system's other planets, an initiative to land humans on the surface of the moon. With time, each of those dreams became a reality - the Hubble Space Telescope, the twin Voyager spacecraft, the Apollo program. All except one: an effort to get a close look at the Sun, the source of Earth's light and heat, as well as solar storms that could disrupt our satellites and fry our electric grid. It took decades for the technology to protect scientific equipment from the Sun's ferocious rays to be invented. On a recent morning, a spacecraft not unlike the one envisioned in 1958 sat in a sterile room at NASA's Goddard Space Flight Center. Its side panels were open to expose its inner workings - electronics boxes, a propulsion tank, instruments for measuring the Sun's magnetic field and capturing images of its tumultuous atmosphere. The spacecraft's heat shield was encased in a separate container, emblazoned with large red lettering that admonished "HANDLE ONLY UNDER SUPERVISION" and "DO NOT EXPOSE TO DIRECT SUNLIGHT." Pointing out the warnings, engineer Curtis Wilkerson chuckled. This summer, the Parker Solar Probe will launch on a journey that will send it skimming through the Sun's atmosphere at a pace of 450,000 mph (724,205 km/h) - fast enough to get from Washington to New York in about a second. It will fly within 4 million miles of the Sun's surface - seven times closer than any spacecraft has gotten before. That heat shield will not only be exposed to sunlight, it must withstand blasts of 2,600 degrees Fahrenheit (1,427 degrees Celsius) - while simultaneously maintaining the instruments on the other side at roughly room temperature. After 60 years of advances in science and technology, this craft will probe our star's mysteries and monitor behaviour that could affect everyone on Earth. "We will finally touch the Sun," Nicola Fox, the mission's project scientist, likes to say. 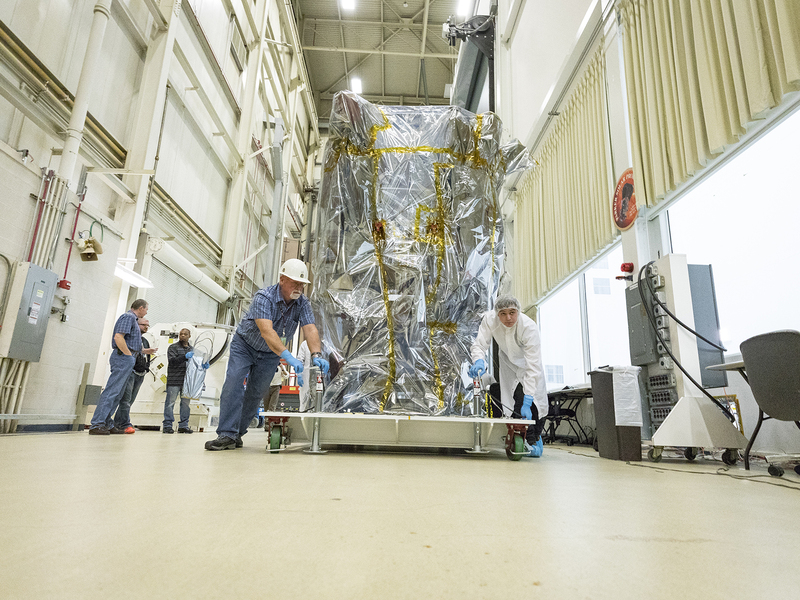 "But first," Wilkerson said, "we have to get it to the launchpad,"
Wilkerson is a systems assurance manager with the Johns Hopkins Applied Physics Laboratory, which built the Parker Solar Probe. It's his job to ensure the scientists and engineers who work on the spacecraft follow the protocols in place to protect it. Metal objects must be demagnetised so they don't affect the instruments. Technicians must wear hairnets, gloves and ground bracelets that dispel static electricity so they won't give the spacecraft a shock. Even ordinary notebooks are banned - instead, visitors are handed sheets of special paper designed not to shed microscopic debris. Harsh though the environment around the Sun may be, the biggest threat the probe will encounter in its lifetime is a careless human. With Wilkerson and his colleagues on hand to keep unreliable humans (especially rogue reporters) in check, APL's integration and test lead Annette Dolbow oversees the process of actually putting the Parker Solar Probe together. In the past few months, under her watchful eye, a collection of metal parts constructed at labs around the country coalesced into a Prius-sized, vase-shaped spacecraft. The process has made Dolbow intimately acquainted with the probe's quirks. She compared it to a toddler: endearing, but constantly giving her cause for anxiety. On the one hand, there are features like the Solar Probe Cup, which will poke out from behind the heat shield to scoop up samples from the flood of high energy particles escaping the Sun. "It's the bravest little instrument we have," Dolbow said. One the other hand, there's the probe's cooling system, which works like a radiator containing five litres of pressurised water and is unlike anything ever used on a spacecraft before. "Water and electronics - they're not good friends," Dolbow said. Dolbow's team has also subjected the spacecraft to a battery of tests to ensure it can handle the hazards of flight - baking it, shaking it, blasting it with lasers. Last week, they began one of the probe's most significant trials yet: thermal vacuum testing. Over the course of seven weeks inside a dark, 40-foot-tall chamber, the spacecraft will be chilled to -292 degrees F (-180 degrees C) to simulate the bitter cold of space, then blasted with heat proportional to what it might experience during its closest approaches to the Sun. Engineers will test the spacecraft's hardware and perform a flight simulation under a range of harrowing conditions. With that over and done with, the spacecraft just has to be packed up, shipped to Florida, placed atop a rocket and blasted off the Earth. Passing by Venus, it'll get a gravitational boost needed to swing into a series of 24 egg-shaped orbits around the Sun. With each close approach, the probe will fly through the Sun's atmosphere, called the corona. In those moments, the carbon composite heat shield about the thickness of an encyclopedia will be all that stands between the spacecraft and temperatures hot enough to melt iron. "That technology just didn't exist 30 years ago," said Eric Christian, a physicist at Goddard and the deputy principal investigator for one of the Parker Solar Probe's main instruments. Why exert all this effort just to fly close to the Sun - an endeavour multiple Greek myths warned us against? As Christian explained it, the story begins with a young solar scientist named Eugene Parker, who was the first person to realise the solar wind of charged particles streaming from the corona moves faster than the speed of sound. That finding, published in the 1950s, was initially dismissed by the astrophysical community - but then direct observations confirmed it. The acceleration of the solar wind remains one of the "fundamental science questions about the Sun," Christian said. That lingering mystery is why NASA is so eager to explore our star, and why the space agency took the unprecedented step of naming the solar probe after Parker, who is now 90. No other spacecraft has ever been named for a living person. The probe will also investigate two related mysteries: Why is the Sun's atmosphere hotter than its surface? And how do high-energy particles get sped out of the corona and into space? "These are questions we were trying to answer from 93 million miles (150 million km) away," Christian said. "But the fact is, you've got to go where the action is in order to really understand what's happening." The answers are keenly relevant to life on Earth. Disruptions in the Sun's atmosphere can generate huge explosions of ionised gas, called coronal mass ejections, and bursts of radiation known as solar flares. When CMEs interact with our planet's magnetosphere, they induce electric currents that may travel through the ground and rupture power grids. Meanwhile, solar flares can interfere with radio communication and cause radiation poisoning in any space-faring astronauts who are unprotected by Earth's magnetic field. Predicting these events will require the scientists to figure out the complex physics of the fusion reactor in our sky. "People forget," Christian said, "but the Sun is a variable star." From Earth, it may seem like a warm, monochrome orb. But the picture Christian paints is more like something Van Gogh would produce: Jets of powerful radiation shoot out of the atmosphere. Long lashes of plasma called magnetic loops arc across its surface. Bursting bubbles of super hot gas spew their contents into the sky. "It's this really dynamic place," Christian said. "Now we're finally getting to go there."